← What’s the magic word? Several years ago a mom came up to me and shared an idea from her former church. She told me about a program that the children’s pastor led every week called “Baby Praise”. It meant so much to her as a young mom to be able to connect with other young moms during the week and to do something fun with her child. 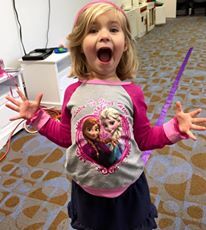 She described Baby Praise as a time when moms and their kids sang fun songs together- many of them familiar nursery rhymes – and the children’s pastor would have a “mirror time” with each child where she sang a short song to them about how they are special to God. I LOVED the idea!! So, I decided to start something similar at my church. Over the past few years Baby Praise has morphed into a wonderful opportunity to partner with parents! Each year my associate and I have tweaked it until we have a program I am very proud of! We have a few holdovers from the original idea, but the new items we have incorporated are what help us reach our goal of partnering with parents. 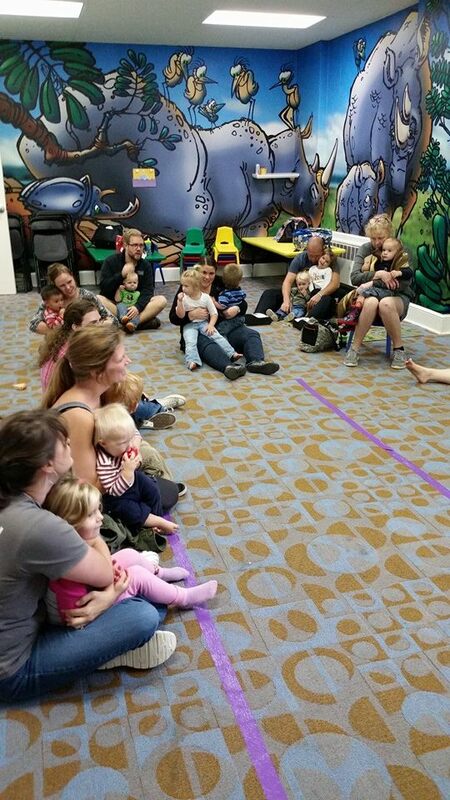 Every Thursday morning at 10:00 the moms (and sometimes dads) and children meet in one of our preschool rooms. We start with a five finger prayer that even the littlest can participate in. As we hold up each finger we say – “Good morning Lord. This is your day. I am your child. Show me your way. Amen. Hearing those sweet little voices saying that prayer every week melts my heart. I pray they will remember this prayer long after they have outgrown Baby Praise. Next we sing three songs from our Sunday morning experience. Every month we choose six songs that complement our lessons for that month. Since we have two teaching hours and many of our children attend both hours, they will learn all six songs over the course of the month. For those children who only attend one hour, we alternate which songs are sung which hour each week so that those children will be able to learn all six songs as well. It is adorable to watch the moms and kids singing, jumping and doing all the motions together. Next we review our Memory Verse for the month and motions and then we watch the Ollie video from the previous Sunday. This way parents see what their kids saw that week. It’s great for kids who missed the previous Sunday too! Our preschoolers LOVE, LOVE, LOVE Ollie, Stormie Jane and all our friends in our First Look video. We then sing the other three songs for the month. One of my favorite parts of Baby Praise is after our singing when I play a song called “How Much Do I Love You” by Jana Alayra. Moms snuggle with their little ones while singing along. “From deep inside my heart, to the farthest star, is how much I do love you.” Such a precious time to quiet our hearts and love on each other. Our last item on our agenda is SNACK!!! Everyone loves snack!!! Each mom brings the snack that she wants her child to have. And while the children are snacking, moms are visiting and I get to do my MOST FAVORITE part of Baby Praise – MIRROR TIME!!!! He thinks you are special, very, very special. Yes He does. Yes He does. I absolutely ADORE this time with each child. Some are a little shy and others not so much, but every single one of them are truly special to God and to me! It blesses my heart to watch moms interact and encourage each other. Every week when I leave Baby Praise my heart is so full. I love seeing my little friends. I love encouraging moms and dads and I love multiplying the time we have on Sundays to teach God’s word. Yes, there is no doubt that Thursdays from 10-11 AM is my favorite hour of the week. 5 Responses to Baby Praise. My favorite hour of the week. Since learning the five finger prayer, we pray it with the twins each morning and they love to high five each other after “Amen!” So simple, precious, and honest for their age. That’s one prayer they’ll certainly remember! That is so precious!!! Thank you for sharing!! I love this idea. I would love to try something like this in our church. I am the nursery director at our Kansas church. What ages do you include in your program. We also use the First Look curriculum, so I love the idea of using the weekend Ollie video and going over the memory verse. Do they pre-sign up each week or just come? Any information you can give me I would greatly appreciate. Thank you. Hi Colleen! Thank you so much for commenting! 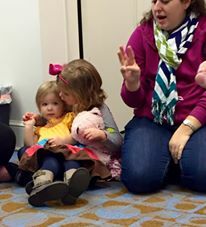 Baby Praise is one of my favorite activities that we do to partner with parents. We are a small groups church, so Baby Praise technically falls under small groups and follows our small group semester schedule. We generally have people sign up at the beginning of the semester, but we welcome anyone who would like to come! Since they bring their own snack, there really isn’t any problem with extra people coming. Sometimes I will announce it on facebook and we may see new faces from that. We always start with the five finger prayer, which I outlined in the blog post. Every month we have 6 songs that we do on Sunday mornings. Three each hour and then we rotate each week so that if a child comes the same hour every week he will hear all six songs during the month. We do three songs at Baby Praise after the 5 finger prayer. Then we stop to have our First Look lesson video from the month before. Next we review the main points (God made me. God loves me. Jesus wants to be my friend forever) and the memory verse and pray. We then do the other three songs followed by a special song – How Much Do I Love You by Jana Alayra – where all the kids sit on their parents laps and snuggle close. 🙂 We close in prayer and thank God for our snacks. While the kids are eating the snack their parents brought I do my mirror song to each child individually.